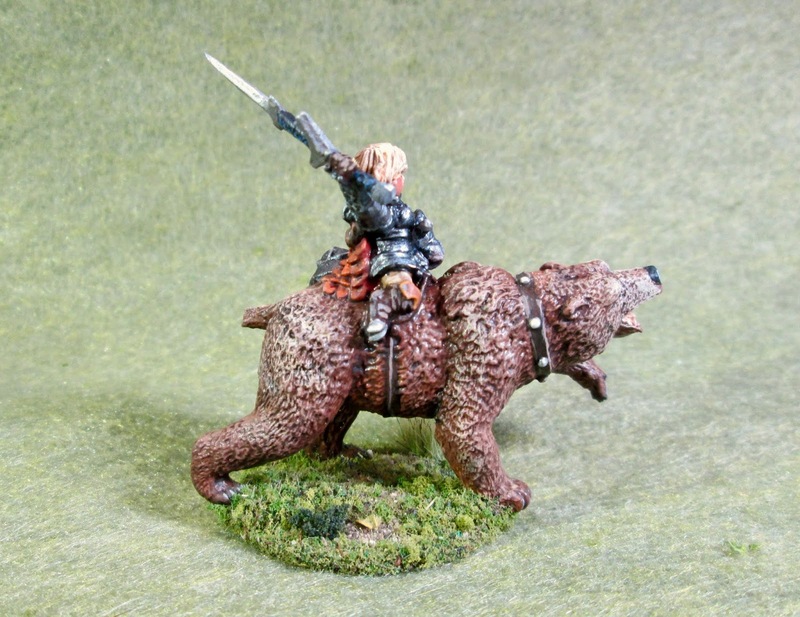 Ursula, Dwarven Bear Rider: Bones 2 Figure | H.A.W.K.S. 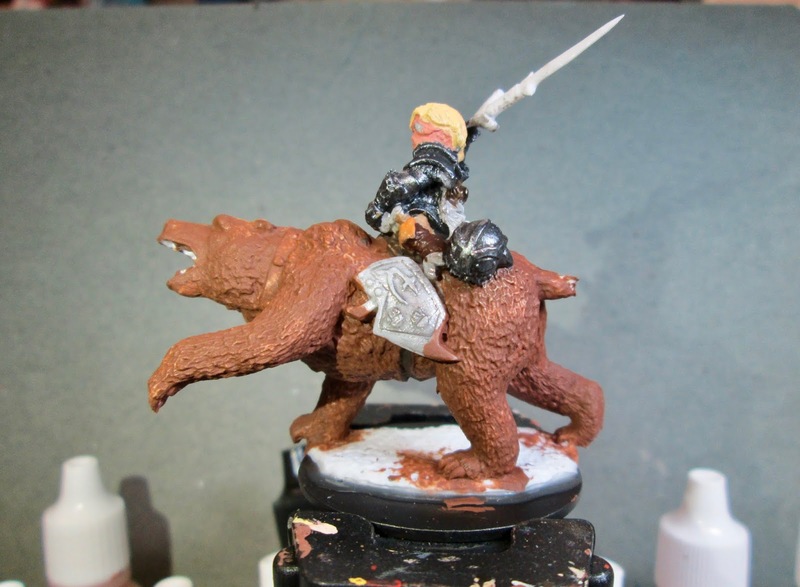 This past week I worked on Ursula, Dwarven Bear Rider, which was released as part of the Bones 2 Expansion 2 set. I didn’t get that set originally, and picked up this figure from a friend who had. I selected her to paint this past week, as I wanted her to be the Dwarven Commander in a game I’m running at next month’s Historicon gaming convention. I prepped this figure in the usual way; soaking it in a dish of water with a couple drops of dish-soap added, then giving it a light scrub with a soft toothbrush, and then rinsing and drying it. 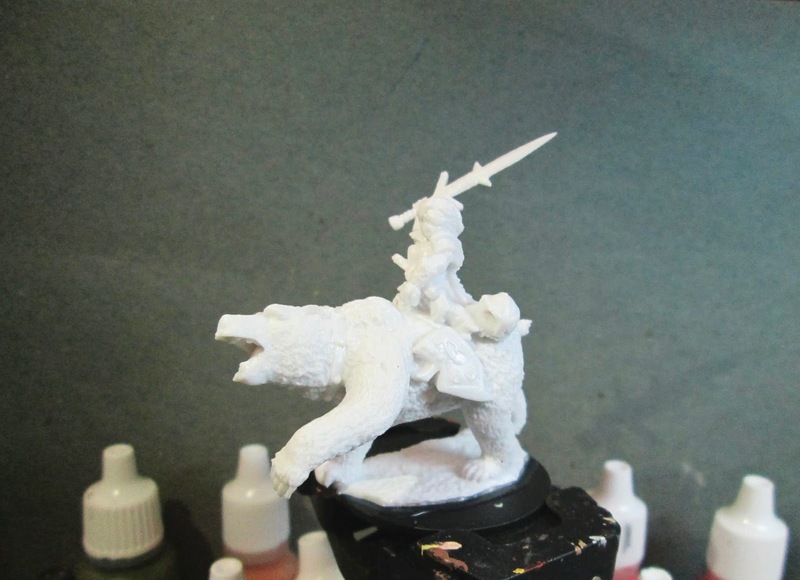 I then trimmed the figure’s integral base a little and then glued the figure to a black-primed 1.5" fender washer with Aleene’s Tacky glue. I then placed the figure in my painting grip. I began by painting the armor Ceramcoat “Black”; and when it was dry, I drybrushed the armor with Folk Art Metallics “Gunmetal Grey”. 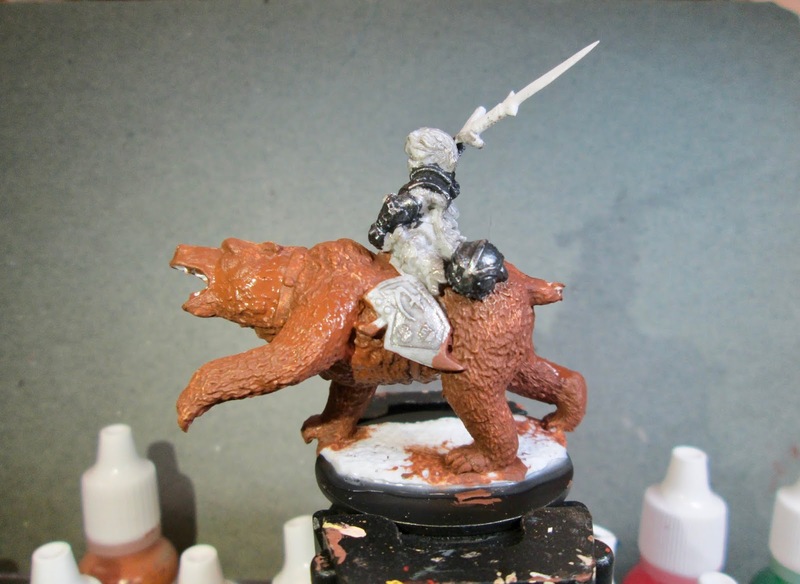 After that, I painted the bear with Crafter’s Edition “Cinnamon Brown”. I then painted her face with Americana “Shading Flesh”, and her hair with Ceramcoat “Maple Sugar Tan”. Next, I painted the saddle and girth with Americana “Bittersweet Chocolate”, and her pants with Americana “Khaki Tan”. After that, I did her boots and the fur at the top of her cape with Accent “Real Umber”, and the painted the tops of her boots with Americana “Terra Cotta”. I went back to the “Bittersweet Chocolate” and painted the strap around the bears neck, and then painted his mouth with Apple Barrel “Apple Lt. Pink”, and his teeth with Americana “Antique White”. I then painted his claws with Americana “Charcoal Grey”, and then did the Dwarf’s cape with Anita’s “Burnt Sienna”. After everything had time to dry, I gave her face a wash of Citadel “Reikland Fleshshade” wash. 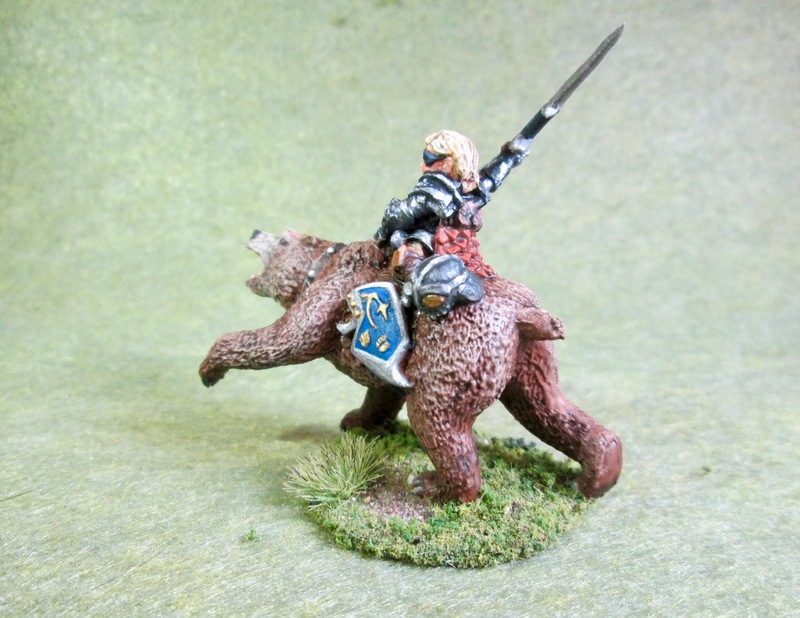 When that wash was dry, I then gave a wash to her hair, cape, pants, and boots, as well as the whole bear, with Citadel “Agrax Earthshade” wash. When that was dry, I painted her eye, then highlighted her face with a mix of the base “Shading Flesh”, and some Crafter’s Acrylic “Flesh”. After that, I highlighted her hair with some of the “Antique White”, and then with some Apple Barrel “Lemon Chiffon”. Next, I painted her eyepatch, dagger sheath, and the two grips on the sword with Reaper MSP “Coal Black”. When dry, I highlighted them all with Citadel “The Fang”. Next, I highlighted her pants with the “Antique White”, and then highlighted her cape with Americana “Burnt Orange”. I then highlighted her boots, and the fur at top of her cape, with Americana “Mississippi Mud”, and then highlighted the tops of the boots with Accent “Golden Oxide”. 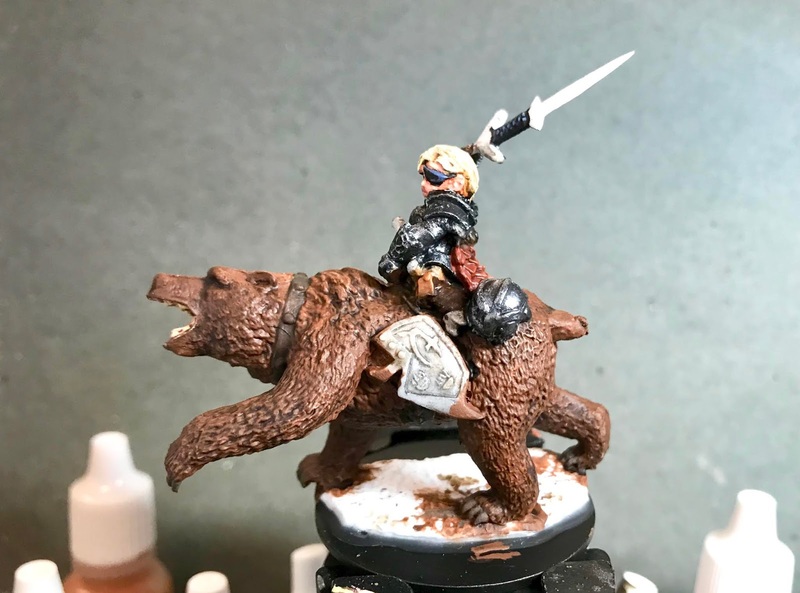 I now worked on the bear; highlighting him first with a drybrush of Folk Art “Teddy Bear Brown”, followed with a drybrush of Ceramcoat “Territorial Beige” on the higher points. I finished by drybrushing his muzzle, shoulder, hips, and rump with a little Folk Art “Barn Wood”. Next, I highlighted his teeth with Americana “Bleached Sand”, and his claws with Crafter’s Acrylic “Storm Cloud Grey”. I painted his nose and eyes with the “Black”, and highlighted the nose with a little Americana “Dove Grey”, and his eyes with dots of White. After that, I got out the “Mississippi Mud again, and used it to highlight the saddle girth and neck strap. At this point I painted the shield with Americana "True Blue”. I then painted the sword, metal claws on her boots, and the shield border with Americana “Zinc”, and when they were dry, I painted over them, as well as painting the studs on the neck strap, with Folk Art Metallics “Gunmetal Grey”. I then highlighted them, and all the other armor with Ceramcoat “Metallic Silver”. I next painted the decorations on her shield, and the eyepatch on the helmet, with Ceramcoat “Bronze”, and when dry, went over them with Americana “Wedding Gold”. I’m really amazed at how this came out. This may be my new favorite figure; not only is it a super-cool sculpt, but I think I did a pretty good job with it as well. 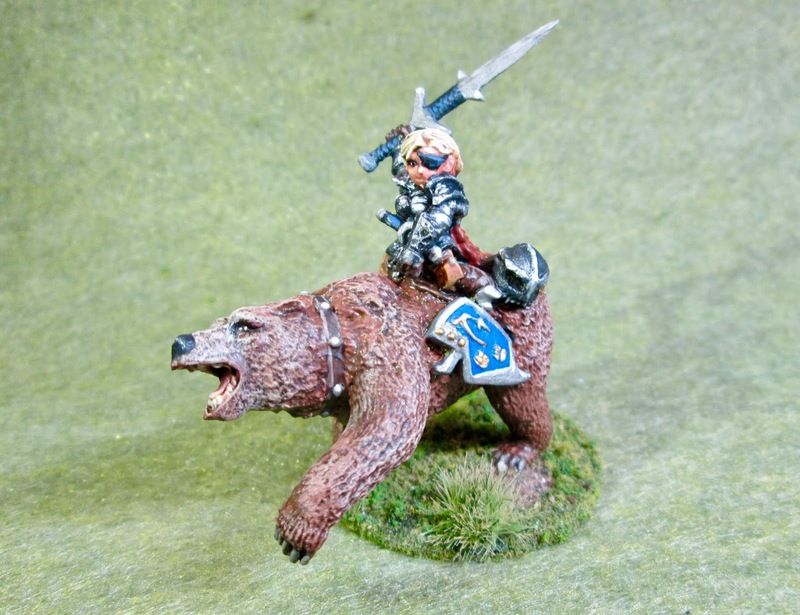 I only wish she had a whole unit of Bones bear-mounted Dwarven women to command!